A little while ago I was reading an excellent post over at +charles atkins' blog about the upcoming release of the various 5th edition/Next product line and how WotC is attempting to woe back older gamers by miming old releases and embracing the product's history. Again an excellent article but ... then there was this one line. As a lot of D&D players 4th edition was not my favorite and it was what led to my eventual exodus from gaming as a whole between 2010 and 2012 when I discovered Swords & Wizardry. However, there is one spot of 4th that I was a huge supporter of and that was the Essentials line. Essentials did for me what I felt was needed to keep me interested in the game. The books were smaller and softbound and much easier to transport over the huge hardbound tomes that have come to represent the market. Character creation and development while less dynamic, was quick and helped led to the quick jump-in games that I was involved in during that time. However, most importantly was price of the line. While the traditional D&D books were running for $40.00 and up the essentials line was relatively cheap and typically around the $20.00 mark. Also given that I am prone to playing fighters and hated (HATED) the 4th edition “I have magic too” fighter, the Essentials “stance” fighter was my tipping point. I enjoyed the minor but quickly modified bonuses depending on stance. I enjoyed “getting back to basics” and just having to worry about hitting things not managing invisible cool down bars. Most of all, though, I liked that the essentials line unconsciously undid a lot of the dungeon punk feel that coated almost everything released for 4th edition. I am not defending 4th edition, as a whole the entire endeavor was a mess from the horrible “The Game is the Same” videos, to the treatment of players as mindless children in need to guidance. A lot of bad blood was created with 4th, but some good things came out of it as well. D&D Encounters and Dungeon Delves are great short rumps in the world of gaming that I thoroughly support. 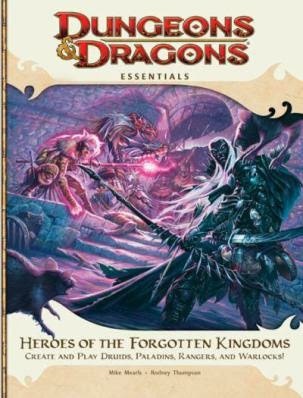 The Essentials line was an inspired (if abandoned too quickly) attempt to refocus the core of the edition to its more traditional roots and – while I know I’ll catch flak for this – the Nentir Vale was a fun place to explore and read about (Temple of Yellow Skulls was my favorite book in 2011). Most of 4ed problems in my opinion came from this absurd need to create rules for every situation - as if players can't handle some freeform.